A new edition of Jewish Heritage in Britain and Ireland celebrates the undiscovered heritage of Anglo-Jewry. First published in 2006, it remains the only comprehensive guide to historic synagogues and sites in the British Isles. 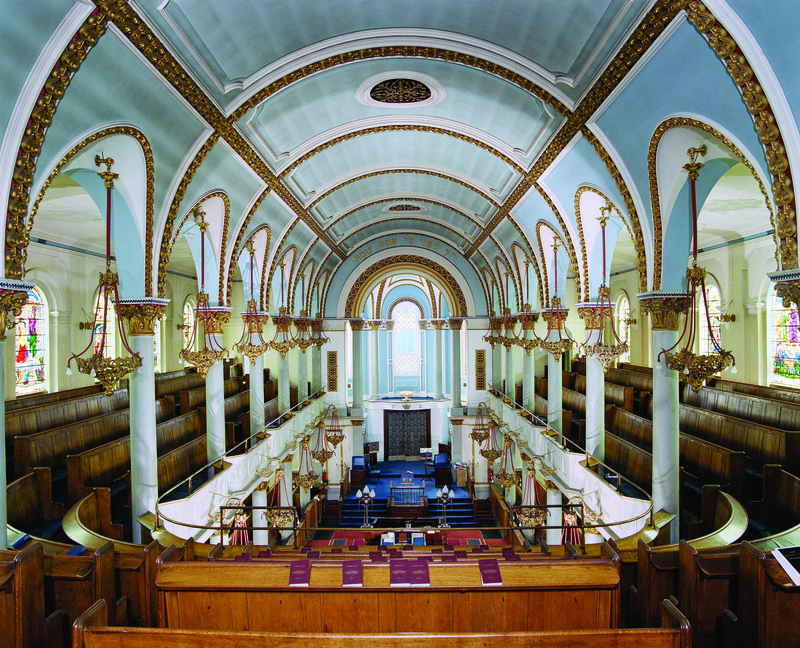 Included are many of England’s splendid synagogues; from Bradford Synagogue built in Islamic revival style to Brighton’s opulent Middle Street Synagogue hidden behind a modest granite façade. 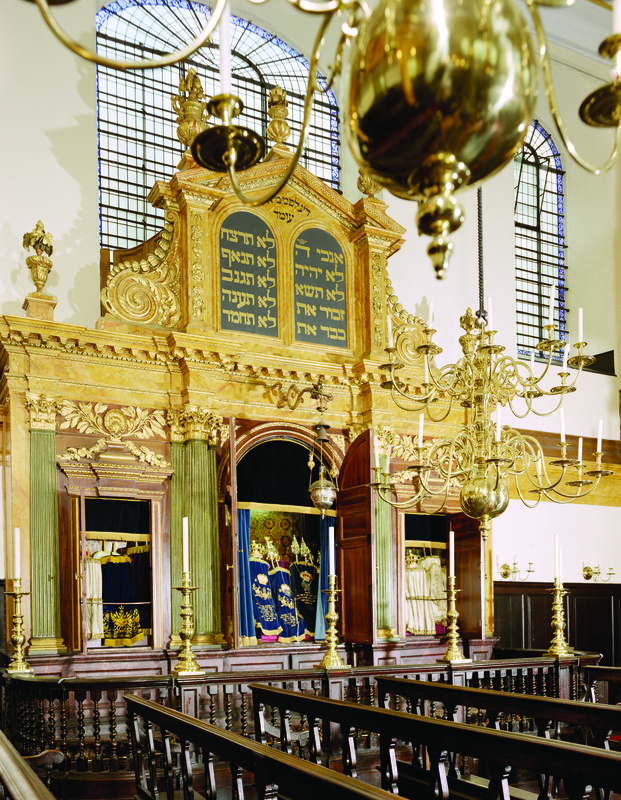 This hidden gem in the City of London is Britain’s oldest synagogue, opened in 1701. Designed by master builder Joseph Avis, the style was influenced both by Wren City churches and the Portuguese Great Synagogue of Amsterdam, the parent congregation of the English Sephardim. 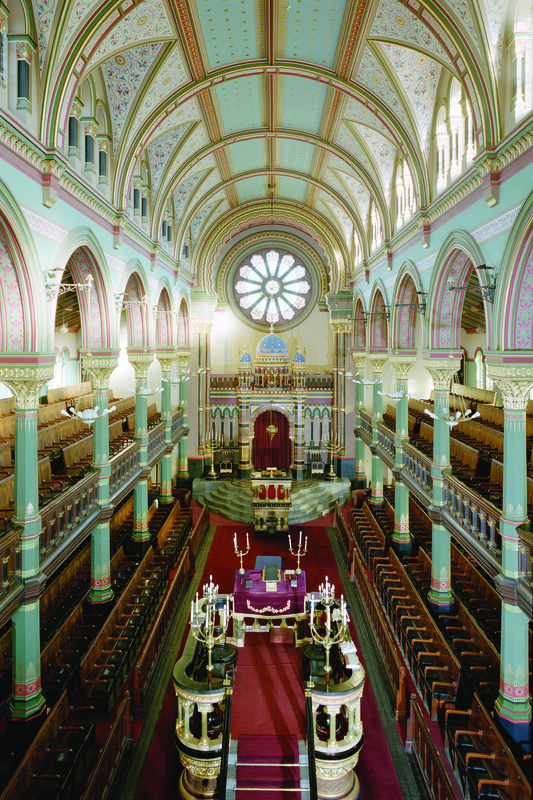 The most lavish High Victorian Oriental synagogue in England, older sister of London’s New West End and designed by the same architect, George Audsley. It opened in 1874 and is Grade I Listed despite losing its turrets in the 1960s. Its gorgeous mint green, stencilled and gilded décor contrasts with the rich jewel colours of the domed and turreted Ark. 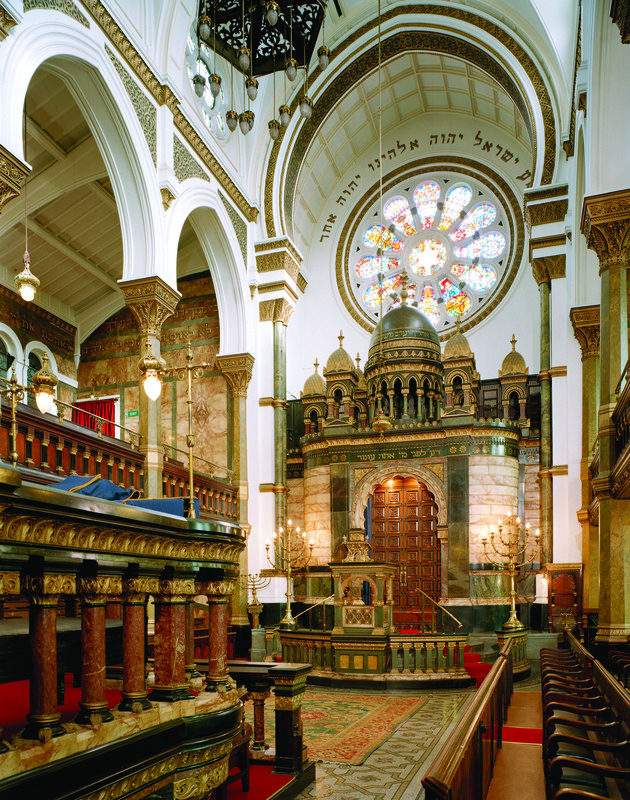 London’s most splendid synagogue interior. Opened in 1879, this synagogue was designed in High Victorian Oriental style by Liverpool-based Scottish architect George Audsley, for the social elite of Anglo-Jewry. 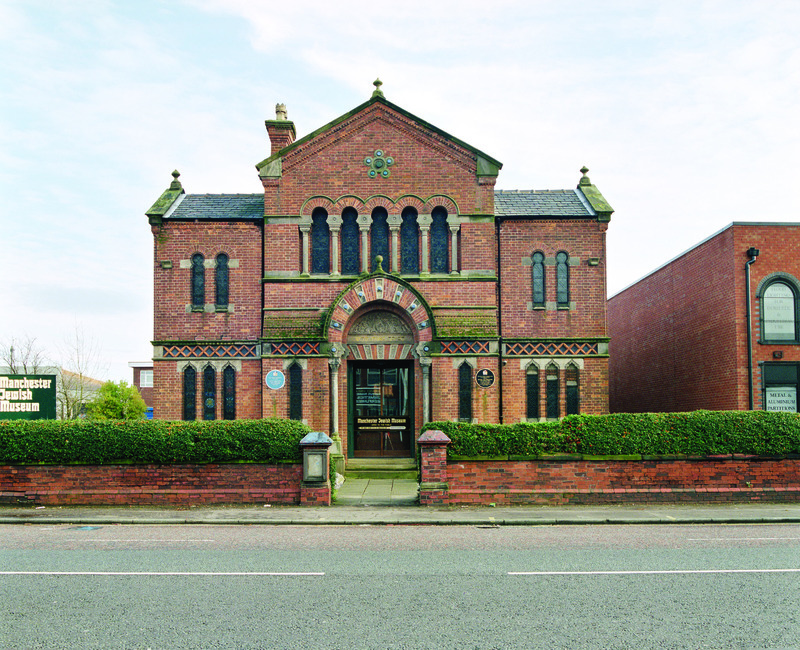 It has much in common, both inside and out, with its ‘older sister’ Liverpool’s Princes Road Synagogue (see below) – designed by the same architect. An opulent jewel in the crown of the South Coast’s most elegant Regency resort. It opened in 1875 to serve the spiritual needs of holiday-making Goldsmids, Rothschilds and Sassoons. It was designed by Thomas Lainson with a lavish interior to rival the splendour of the Prince Regent’s Royal Pavilion. Montefiore Synagogue and Mausoleum, Ramsate, Kent. 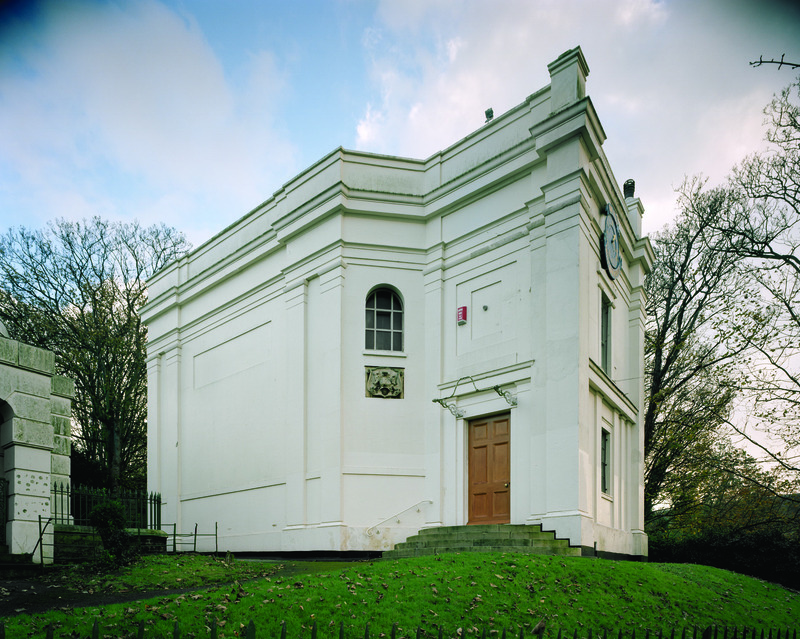 This Regency style synagogue of 1833 was designed by the first Anglo-Jewish architect David Mocatta, and is the curious last resting place of Sir Moses and Lady Judith Montefiore. Built in 1862, it was modelled on Rachel’s Tomb outside Bethlehem. 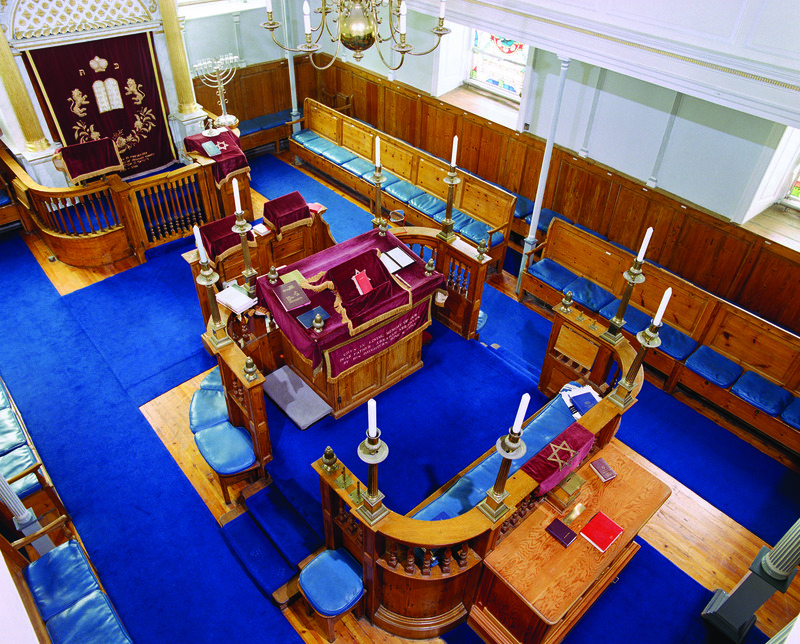 Housed in the former Spanish & Portuguese Synagogue of 1874 in Cheetham, it was once the hub of Manchester Jewish life. Built in Moorish style, the architect was Edward Salomons who was of German Ashkenazi background. Its permanent collection documents the history of Manchester Jewry, while special exhibitions often focus on the cultural diversity of present day Cheetham. This is the oldest Ashkenazi synagogue in Britain and the oldest in the English-speaking world. It was built in 1762-3, a year before Exeter Synagogue (1763-4), both now 250 years old. 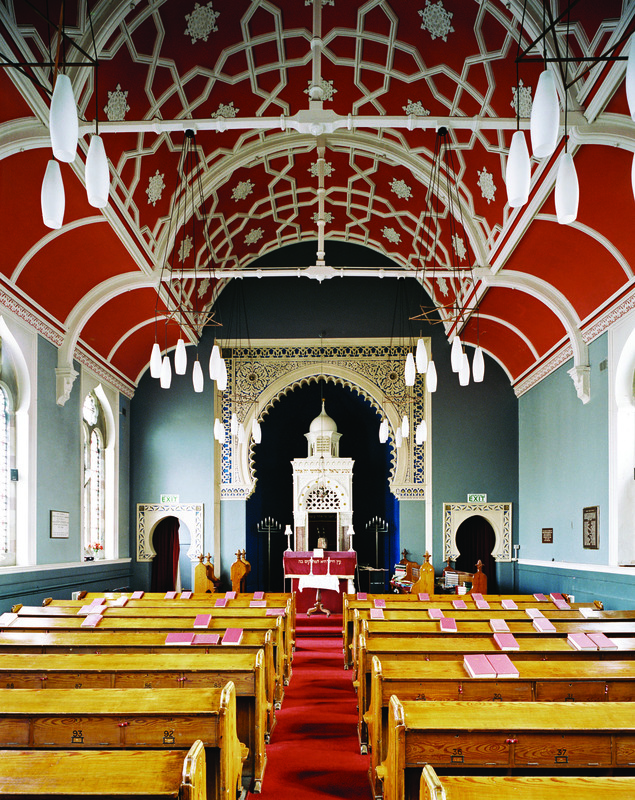 They are both examples of rare Georgian synagogues designed in low-key fashion like non-conformist chapels in the era before Jewish emancipation in Britain (1858), with gilded Baroque Arks. 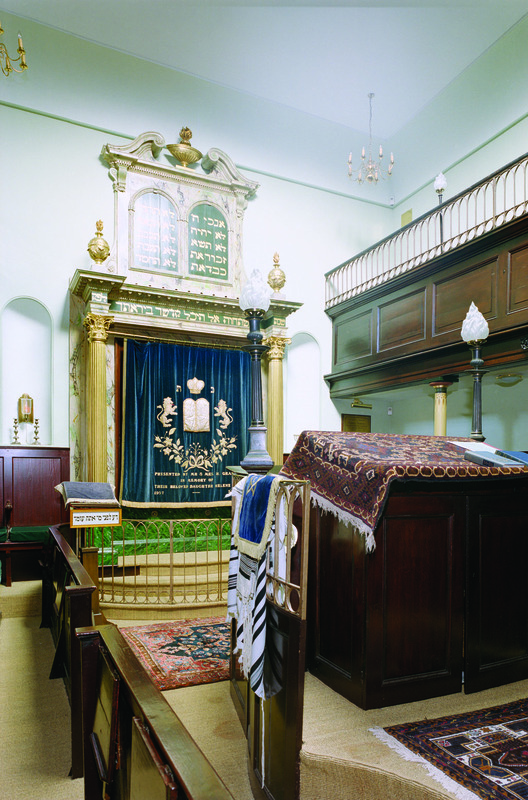 Exeter’s tiny synagogue opened a year after Plymouth’s in 1764. The present Greek-revival porch, flanked by fluted Doric columns, was added later in 1835-6. Originally the synagogue apparently had no windows at all, being lit only from above by a lantern. The internal delicate metalwork of the ovoid bimah is the most elegant and stylistically unique in the country. The earliest functioning ‘cathedral synagogue’ built in the era of Jewish emancipation in Britain, now over 150 years old. Designed in Italian Renaissance style in 1855-6 by leading civic architect Henry Yeoville Thomason, who was also responsible for Birmingham’s Council House and Art Gallery. This Oriental gem of 1880-1, in the heart of Yorkshire, was built for the German Reform community of woollen merchants who predated the Orthodox in the city. Designed by local church architects the Healey Brothers, it features such exotic touches as striped brickwork, horseshoe arches and a decorative cornice, inspired by a mixture of Mamluk Egypt, Moorish Spain and Mogul India. Can’t see your chosen synagogue on the list? Let us know your favourite in the comments below. Explore more in a new edition of Jewish Heritage in Britain and Ireland by leading Jewish expert Sharman Kadish, which celebrates in full colour the undiscovered heritage of Anglo-Jewry. It remains the only comprehensive guide to historic synagogues and sites in the British Isles, based on an authoritative survey carried out with the support of English Heritage and the Heritage Lottery Fund. Glasgow’s Garnethill got left off this list. This is because it was compiled for Historic ENGLAND. The book itself covers Scotland, Wales, Ireland (Northern and Republic) – and even the Channel Islands and the Isle of Man. It doesn’t include Gibraltar, which has a separate companion guide all of its own: ‘Jewish Heritage in Gibraltar’. See the Publications Pages of http://www.jewish-heritage-uk.org for further information. 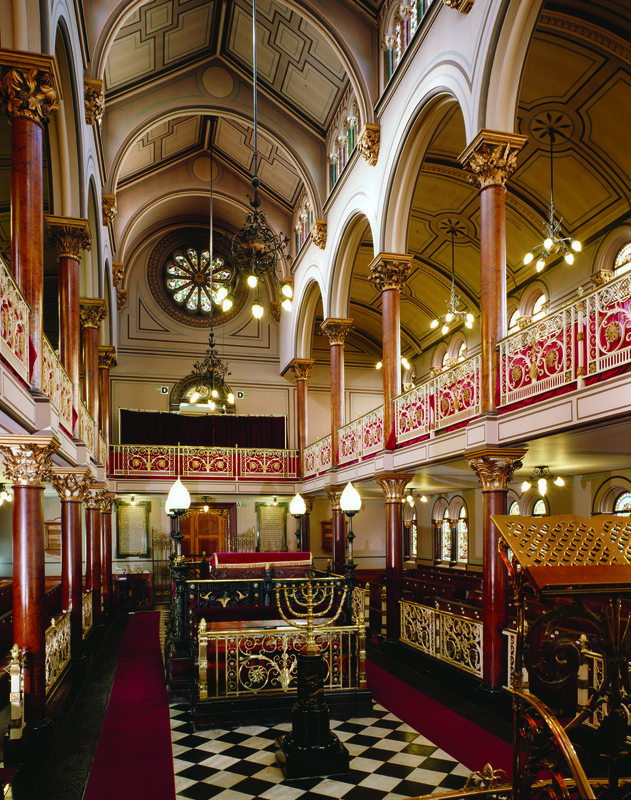 These Synagogues are all beautiful, I am familiar with the Jewish Museum in Manchester, which is very ornate. But you have only included old synagogues, and there are some beautiful modern ones. Yeshurun in Gatley, near Manchester, has beautiful tapestries depicting the 12 Tribes of Israel, and is ornate in a modern style. I am not Jewish, I went to Yeshurun as a “mummy helper” on school visit with my daughter, and was surprised by how modern it was, as well as by those tapestries – my own church has something very similar. I lived for a few years in London and Herts, and visited most of the large synagogues in both areas. So now I want to ask how you selected 10 of England’s most beautiful synagogues and whether the ranking was in any special order. To my eyes, the ones described as Victorian Oriental are sensational eg Princes Road Synagogue Liverpool and New West End Synagogue London, but not necessarily the Bradford Synagogue. What about Eggerton Road Synagogue?